Nishi-Awa is in Tokushima. People here live a traditional lifestyle and farm off the land on 40-degree slopes. The area also has the historical Udatsu Townscape, once a merchant town. Experience a unique side of Japan in Nishi-Awa. Picture courtesy of JTB Communication Design, Inc.
Tokushima is in the Shikoku region of west Japan. It is a prefecture with traditions and great outdoors like Awa Odori, a festival practiced since 1586, the Naruto Strait, one of the world’s three greatest currents, and mountains like Mt. Tsurugi and Mt. Bizan. This area has been called Awa since before the Meiji Period and is a name is still used often to this day. In this article, we’ll introduce Nishi-Awa, an area in Tokushima designated a Globally Important Agricultural Heritage System (*1). *1 Globally Important Agricultural Heritage System: landscapes that operate globally important and traditional agriculture industries. These areas are recognized by the Food and Agriculture Organization of the United Nations (FAO). There are 52 recognized spots in 21 countries. Nishi-Awa is the collective name for Mima, Miyoshi, Tsurugi, and Higashi-Miyoshi located in the mountainous regions of western Tokushima. The lifestyle and food culture of the people who reside and work in agriculture here has been maintained for 400 years. This area is exhibits a traditional side of Japan not seen in Tokyo or Osaka. Nishi-Awa is a place where the way of life has been carefully maintained. The Udatsu Townscape, found in Waki, Mima, once prospered as a merchant town in the Edo Period. The townscape of that period still remains, making it seem as if time has stopped. How have the people of Nishi-Awa lived? If you want to learn more about what old Japan was like, want to immerse yourself in its nature, or want to experience the local lifestyle, continue reading! 80% of Tokushima Prefecture is made up of mountains. People lived by clearing mountain slopes to create small settlements or villages. This settlement lifestyle is a main part of agriculture. However, this type of agriculture is slightly different from typical agriculture. Residents in Nishi-Awa developed slope land agriculture, a unique agricultural system that utilizes the sloping mountain land without altering it. The steepest sloping land reaches up to 40 degrees. It is so steep that you might find yourself almost stumbling when you first step onto it. Plowing the fields with farming tools requires physical strength and balance. Different types of field designs help stop the soil from being swept away by the rain or wind. By cultivating the soil together with finely-cut silver grass (a type of thatch grass that grows in the mountains), the soil does not absorb a lot of water. This prevents soil runoff. The grass also helps with fertilizing the land. Produce is grown diversely in small quantities, or is gradually cultivated. The residents have been able to preserve their way of life also due to diversified farming, which includes the production of different crops like potatoes, buckwheat, mountain plants, and grains, depending on the season. The resulting produce are used by the farmers for their meals, divided amongst villagers, and sold at roadside stations. This is how the residents live every day. In an area deeply rooted in its own unique culture, there is cuisine you will not find anywhere else. Sobamai zosui (buckwheat porridge) is a rice porridge made with the grains found in buckwheat seeds, the main ingredient in soba noodles. The buckwheat seeds are boiled together with vegetables and mushrooms. This type of home cooking is eaten every day. Ingredients and seasonings in the porridge will vary slightly by household, so it is truly a dish that reveals the taste of that family. It has a unique, grainy texture, and a very gentle flavor. It is full of healthy ingredients. We felt like we were becoming healthier as we were eating it. Rice porridge isn’t the only way to use buckwheat seeds. Farmers grew mostly buckwheat due to the difficulty in cultivating rice, as it was more suitable for the sloping lands of Nishi-Awa. An area called Iya in Miyoshi has a climate ideal for making delicious soba noodles. These noodles are thick and voluminous compared to the soba noodles that you’ll find in more urban areas! They are lightly seasoned, and pleasantly satisfying. Cooking isn't the only aspect in which the residents are self-sufficient in. Special farming tools are used in Nishi-Awa so that even the soil at steep angles can be cultivated. In the past, each settlement had their own blacksmith to create their tools. However, Mr. Omori, who lives in Tsurugi, is now the only person making these tools. 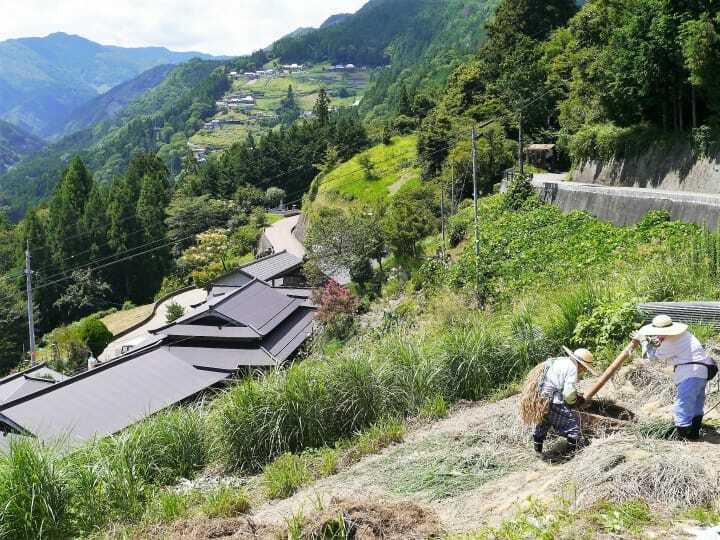 Those who have sloping farms visit Mr. Omori to purchase and repair their farming tools. Nishi-Awa is where you can have a one-of-a-kind experience. Rather than visiting for the sightseeing, we recommend coming here to learn about the rural way of life and to interact with the residents here. You can stay at Koya (Japanese), a private lodging in an old and large Japanese residence, in Higashi-Iya, Miyoshi. You can experience village life with the Nakayamas, the owners. This old Japanese residence was built about 100 years ago. It is very spacious and sturdy. Here you can experience a traditional home with an irori (fireplace), engawa (veranda), and shoji (sliding doors). Areas such as the baths and restroom, are remodeled and extremely beautiful. At the residence, you can learn how to make regional dishes and soba noodles or try farming and wood-chopping. This work is part of Mr. Nakayama’s actual everyday life. Though the couple are only able to provide support in Japanese, they will communicate with you through the use of gestures and experience. We recommend staying two nights or more. You can spend a relaxing time at this old Japanese-style home in the middle of nature at about 13,000 yen per night. For details, please check this website (Japanese). We also recommend the Nakajima family’s farmhouse lodging in Mima if you want to have a full-scale agricultural experience. Here you can farm on sloping lands with Mrs. Nakajima during your stay. Nishi-Awa is abundant in nature and also contains old, preserved townscapes. The Udatsu Townscape in Mima is where buildings from the mid-Edo to Showa periods still stand. At that time, it was a merchant town that flourished as a production area for indigo dyes used in the traditional textile dyeing method of Awa-Ai. The buildings have a structure not seen in any other region. This unique structure is the portion of the wall on the second floor that slightly protrudes outwards. It is circled in red in the pictures above. This protrusion is called udatsu, or pillar support, and was built at the time to protect against nearby fire sparks. It was also a symbol of the wealth of that family. People that had homes with fine pillar supports were likely wealthy. Even today, the culture of this area has spread throughout Japan through the use of the phrase “no hope in getting ahead (udatsu ga agaranai)” to mean poor business and a lack of success. Indigo blue, a color made from plants, is a traditional color that has been in well-known in Japan since ancient times. The indigo in Tokushima is called “awa-ai” and was a large industry that supported the economy here during the Edo period. You can try indigo dyeing yourself at the Mima Tourism and Exchange Center’s Indigo Dyeing Factory (Japanese) in the Udatsu area. You can learn how the beautiful color is produced by trying out the process firsthand! For this article, we dyed and added designs onto a small handkerchief. Tie off the areas that you want to add a design to with rubber bands (upper left picture), then soak it in the indigo liquid dye (upper right picture). After soaking your item for a fixed amount of time, take it out of the liquid and unfold it to expose it to the air (bottom left picture). The indigo will stain the cloth when reacts with the oxygen. The more you dip your cloth into the liquid dye and unfold it, the more it will deepen into a richer indigo blue color. The section that was tied off at the beginning will remain white due to lack of oxygen and will create a pattern. You will need about 30 to 40 minutes for this process. The handkerchief (small) dyeing experience is 1,000 yen plus tax. It is recommended to make a reservation to participate in the workshop. However, support is only available by phone in Japanese, so we suggest going to the factory yourself. You can also have someone at your lodging make a reservation for you if you are not confident with your language skills. They also sell indigo dyed goods such as scarves and accessories. You can stop by the factory for souvenirs, too! Nodokeya, a guest house, is also located in this area, making it great for staying to enjoy the townscape. Request a Guide to Get the Most out of Nishi-Awa! The flight from Tokyo to Tokushima is one hour and 20 minutes. It will take over an hour by car from the airport to Nishi-Awa but this distance may differ depending on the area. There is not a lot of public transportation, due to its ruralness. There will also be mountain roads that twist and turn for long stretches, so it is necessary to drive with caution. If you want to immerse yourself in Nishi-Awa or wish to interact with villagers or businesses that don’t understand English, you can request a guided tour through AWA-RE. Guide fees begin from 15,000 yen for one day. It may also vary depending on the content of the tour, so please direct your inquiries to the company for details. Nishi-Awa is full of sightseeing spots, nature, agriculture, and the historical Udatsu Townscape. There are also activities like hiking the Kazurabashi Bridge, a bridge made from vines, and river rafting. The company will provide suggestions for your travel plans if you express your interest in these activities when making your inquiries. Nishi-Awa is where you can learn about the towns where people have lived for centuries and a way of life that coexists with nature, passed down over the generations. From living off the land and producing your own food to the strong communities ties here, there is much to learn about in Tokushima.